Thinking About Purchasing A Hot Tub? Please Read This First! According to our research, in the 37+ years that Continental Pool & Spa has been in business, more than 75 other companies selling hot tubs have come and gone in the Omaha area. In that same time, we have offered and provided service on every tub we have ever sold, and we are still servicing tubs we sold more than 25 years ago. Parts for our tubs are almost always available. Parts for our tubs are guaranteed to be available for 20 years after your spa purchase. WE SERVICE WHAT WE SELL! Hot Spring Spa’s (which we have sold exclusively in the metro area since 1989) has been continuously owned by the same leadership since 1977. Many competing brands of tubs have had major changes in ownership and corporate philosophy in that time, and locating parts for many of our competitors tubs can be a frustrating process. Our company is a family owned and operated business and our technicians have more than 37 years of experience in maintaining and repairing our tubs. Given all these facts, it becomes obvious that Hot Spring hot tubs are the logical choice for dependability, craftsmanship, and quality – just as Continental Pool and Spa is the logical choice for your purchase and the customer service you will receive before, during, and after your purchase. So, think about not only what you are buying, but why, and from whom! You are not only purchasing a hot tub, you are also creating a 20+ year relationship with your dealer and manufacturer. 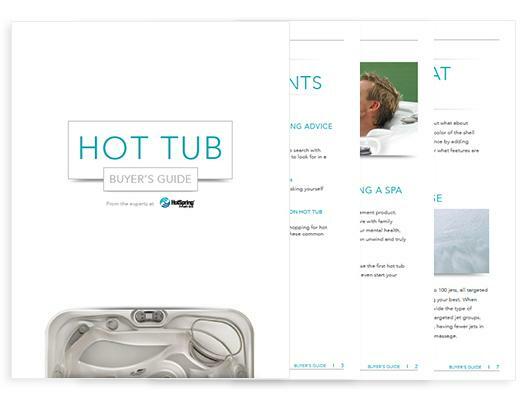 To assist you in your journey towards purchasing a new spa, we created this downloadable Hot Tub Buyers Guide. One of the most common mistake consumers make when shopping for hot tubs is thinking that they have found an unbelievable price on a quality hot tub. Yes, great deals are available, but it is important to remember that not all tubs are created equal. Some advertisers may promote huge tent sales or seemingly phenomenal discounts on “top of the line” spas: generally speaking, if a deal sounds too good to be true, it usually is! Huge spa expos and similar events tend to feature off brand or generic tubs that are not represented by a local dealership or technicians and often cannot be serviced by trained, reputable dealers. Such tubs may seem to offer amazing features at incredible pricing, but remember – you get what you pay for in both quality and after-the-sale follow through and customer service. If the bargain spa you purchase cannot be serviced or repaired locally by an experienced and reputable company, then your bargain tub will not be the bargain you thought you found! Yes, reputable companies, including Continental, do offer occasional factory and/or in-house based and promotions, as well as great financing options , but as mentioned earlier — Continental has been a leading dealer in the Omaha area for seven days a week over the past 37 years, selling only the best quality products. And our second generation will make sure that we are here in another 35, providing you with the best in sales, service and customer experience. Ask the people in the big box store or at the “spa spectacular expo” if you can count on them for those same things! Another mistake consumers commonly make in their decision to purchasing a hot tub is basing that decision solely on such things as the number of jets or the “horsepower” or the “wow factor”. Jets are wonderful things, and when they are incorporated correctly into your tub, a variety of jets will enhance both the therapy and the relaxation your tub provides. The number of jets is not the real question. Rather, the savvy consumer will research the function and placement of those jets. While many spa manufactures design their tubs to appeal to the customer visually, Hot Spring tubs are designed and manufactured to provide the best in design, comfort, engineering and therapeutic benefit. Hot Spring tubs are designed to be used, not just sold. A gazillion jets might make a spa look super cool, but the industry recognized design of the Hot Spring brand of spas blends both form and function in a perfect package. Many manufacturers play the “jet count” game, because it actually cheaper to build a spa with many small jets with limited functionality than it is to build a quality tub with well-thought-out placement and varying therapeutic modes. Again, consumers may be confused when their salesman talks about the motors powering their spa. Remember the terms brake horse power and actual horsepower. Brake horsepower refers to the energy the motor produces as it starts, perhaps the first 5 seconds of operation. Actual horsepower is the continuous power provided by the motor. It is misleading at best if a dealer talks about a 4 horsepower (brake power) motor that in actuality is only providing 2.5 (or less) actual horsepower continuously to your system. It is much more important to consider water flow through the jets (going back to jet count again!) and the engineering behind your tubs design. Hot Spring spas regularly win industry honors for the therapeutic benefits they provide, and those benefits are a combined effect of the proper jet count, jet design and placement, and the right sizes of motors. When you are looking for the best spa at a good price, remember to ask about more than bells and whistles. Ask about insulation R-factors and energy efficiency. Ask about filtration and jet placement, and research the reputation of both the spa manufacturer and your local dealer and their customer service. These should be primary considerations in any spa purchase decision. Your dealer should be able to talk proudly about all of these essential factors. We here at Continental Pool & Spa certainly are! A final mistake many consumers make when purchasing a hot tub is buying before trying. You wouldn’t purchase a car without test driving it, and similarly, you should not buy a hot tub before taking a test sit, and when possible, a test soak. See if the spa “fits” you and vice-versa. If you choose a lounge in your spa, make sure it fits your body. Will all the jets in your new spa truly hit those spots in your body that will benefit from hydro-therapy? If you aren’t comfortable in the tub when it’s dry, you’re not going to be comfortable in it when it’s up and running. TRY IT BEFORE YOU BUY IT! Beware of those “Crazy good deals” offered at EXPOS and the big box and discount stores! Don’t base your decision on purchasing a spa solely on the number of jets, the implied horse power of your power pack or “wow power” of the spas you look at! Try it before you buy it! Ask to sit into your new spa. We offer every customer interested in our spas both a dry spa test and a wet test as well. And remember our corporate philosophy: At Continental Pool & Spa, Customer Service is not a department, it is our livelihood!